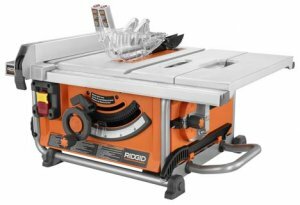 Just this year Bosch introduced their first compact table saw, and either the timing is a coincidence, or its arrival has convinced Home Depot to recommission Ridgid to bring the R4516 back. In general the R4516 had good reviews, but it did have issues with the fence not holding very well. The new Ridgid has a #1 added to the model number (R45161), so this would lead me to believe that some changes have been made to the saw. As far as specs, the R45161 is on par with the other compact table saws on the market, though one interesting feature is the built in wheels and telescoping handle that the R45161 uses for easy transport. The thing that really sets the Ridgid apart is its lower price at $299 vs $350-$399 for the Bosch and DeWALT.